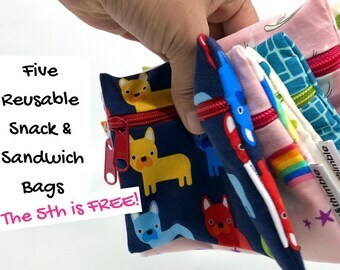 bright + fun lunch essentials for waste free families! Announcement Handcrafted placemats, cloth napkins, reusable snack bags, and more for waste free schools and eco-friendly households. Less waste is a bright idea! Domestic (US) shipping is now FREE ALWAYS. Because YAY FREE SHIPPING! All items are lovingly wrapped in a paper bag and colorful washi for added protection and the fun of unwrapping! Most purchases are mailed in an eco-friendly bubble mailer that is 1) recycled, 2) reusable, and 3) recyclable. Large-quantity orders may be mailed in a regular bubble mailer as my eco-friendly packaging provider does not have larger mailers at this time. But I've put in a request! Personalization is rolling out shop wide. See something and wondering if you can add a name or monogram to it? Just ask! Let's do it! SEE ME MAKE YOUR PURCHASES IN REAL TIME! If you’re on Instagram, find me @penandthimble and you may just catch me working on your purchase in my Stories! I love to share parts of the creative process and work-in-progress over there. You can see firsthand the care and love that goes into making each pen&thimble item. Oh, and if you like exclusive coupons and sales, join the pen&thimble email insiders! I'm also sharing my family's waste-free journey via email too! So far in 2019, we've reduced our paper towel use, made a no-excuses pledge to only shop with reusable shopping bags, and got back on track with composting! 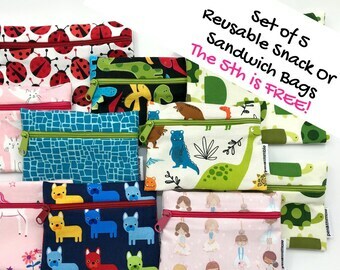 Handcrafted placemats, cloth napkins, reusable snack bags, and more for waste free schools and eco-friendly households. Less waste is a bright idea! I’m not kitten you! Ditching plastic has never been this easy! 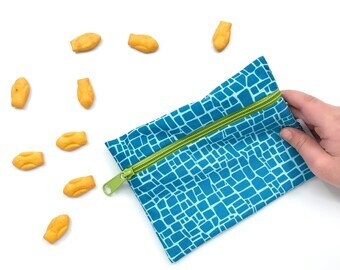 These adorable snack bags are made to be carried and washed over and over again for years! Save $ and save the Earth! Yay! Pairs well with your favorite natural cleaner or vase of wild flowers! New Zero Waste Linen Everything Towels. 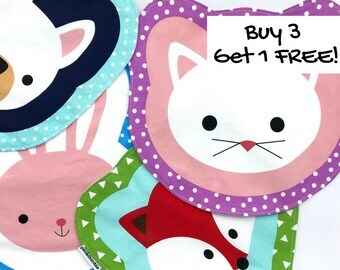 Perfect placemats, kitchen towels, large napkins, dish towels. I made these to be super versatile and a bright + cheerful pick-me-up! A new bundle set. 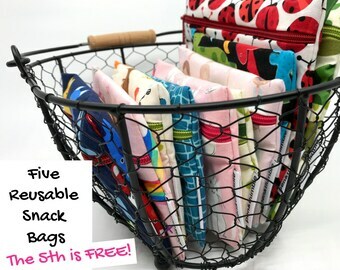 Grab a placemat, napkin, snack bag, and utensil/straw case in one listing! Select one print or mix-and-match! Less waste is a bright idea when you bundle and save! Eco-Friendly Goodies Heading Your Way In Recycled, Reusable, and Recyclable Mailers! Less Waste By The Handful! Less Waste is A Bright Idea! 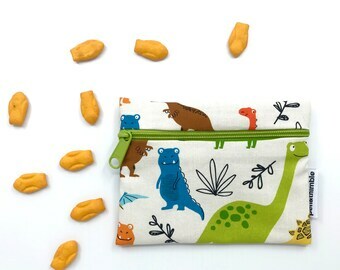 pen&thimble is all about creating eco-friendly products for the whole family with bright colors and prints that pop! I believe that reducing waste starts small and at home. And waste free doesn't have to be just oatmeal tones, but bright and fun and vibrant! I don't make items for the sake of adding more things to a thing-filled world, but to reduce my own consumption of single-use plastics and waste production. I think of what I do as making tools. Bright, fun, and durable tools that highlight small, easy, and yet effective steps in the less-waste movement. pen&thimble is eco-friendly inside and out. I make conscious cuts when I construct items to eliminate textile waste. And all of the textile waste I do produce is recycled. 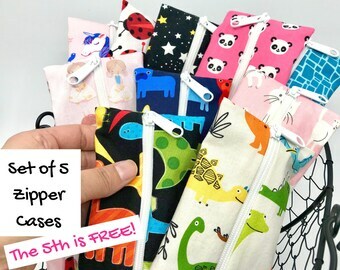 The eco friendly products I create are wrapped in paper with a bit of bright washi tape for fun and mailed in an eco-friendly mailer that is recycled, reusable, and recyclable! If producing less waste is something you're into this year, I’d love if you’d join me! Follow my personal and business waste-free journey I'm sharing on Instagram and Facebook @penandthimble. I'm also using the hashtag #wastefreecurious to share monthly challenges and our waste free wins and fails. So come on over! Creator of pen&thimble. Dedicated mom and maker who believes that reducing waste starts small and at home. Inspired by laughter, giggles, and bright prints! Creative genius and my constant studio companion! Our youngest shop elf! Always brings the smiles (and lots of toys) to the studio! Husband, rock, cheerleader, listener. Doesn't spend much time in the studio, but always down to hear all about what's happening there!